Wildlife rehabilitation can be an incredibly rewarding experience but it’s time-consuming, costly and emotionally challenging. Wildlife rehabilitators, or carers, spend their time, own money and own resources to rescue, raise and rehabilitate native wildlife, so you need to think carefully before making a commitment. Taking care of wildlife is very different from looking after a domestic pet like a cat or a dog. Our wildlife species are incredibly unique and so need special enclosures and very specific diets. They may also need frequent vet visits and they also suffer easily from stress which they do not readily show. Wildlife caring demands dedication and commitment for months, and sometimes years with certain species. Caring for any native species requires specialised knowledge and experience and carers should register with DPIPWE’s Wildlife Management Branch. If you wish to care for Specially or Protected species, including microbats, platypuses, seabirds, raptors, penguins, echidnas, devils, wombats, bandicoots and reptiles, you must have a permit issued by the Department. Most rehabilitators start with partly protected pademelons, wallabies or brushtail possums. Their protected status relates to the numbers of animals in the population and how vulnerable they are, and does not relate in any way to the level of care and knowledge required. All native species need a high degree of knowledge and expertise to be raised successfully. Caring for wildlife is often an around-the-clock job. Feeding – Recovering animals need to be fed several times a day and, in the case of joeys and baby birds, often through the night as well, so their milks will need to be prepared or food for older animals collected in advance. If the time you can commit is limited, young animals may not be the best option. Cleaning – Just like human babies, animals need their artificial pouches changed multiple times each day and washed regularly. In the case of older animals, cages and bedding need to be changed and cleaned at least once a day. Medications – Many animals are sick, injured or just too young to survive on their own and so vets will often prescribe medications to treat their various conditions. These medications may need to be administered numerous times or at very specific times throughout the day. Some animals require months of care but some may take longer… in excess of a year. This can limit options for work and going on holidays, and you will need to arrange for alternate care for animals if you are going to be away. You must dedicate as much time as needed to ensure animals will be100% fit and able to survive when they return to the wild. 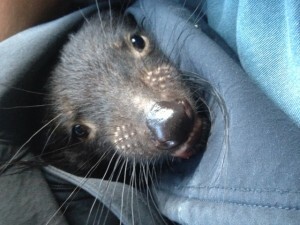 Wildlife rehabilitators are self-funded volunteers. That means carers pay for anything the animal needs includes housing or the construction of specialised enclosures, food, pouches, teats, heat and veterinary care (NB some vets treat wildlife free of charge) themselves. 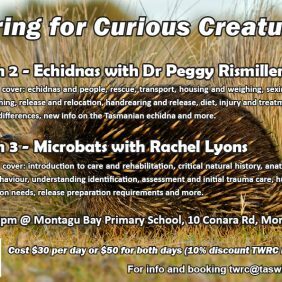 Often care groups have access to discounted or second-hand equipment you can purchase or borrow, but largely all of the costs of rehabilitating native wildlife is borne by you. Do you have the facilities? It’s against the law to keep a wild, native animal as a pet and rehabilitated wildlife legally must be returned to the wild. A wildlife carer’s primary role is to rehabilitate wildlife, giving it the best chance at survival, so it can be returned to the wild. Wild adult animals don’t like to be kept in cages and don’t want close human contact. This means respecting that they are wild and not humanising them to be pets. It is also critically important that wildlife has a healthy fear of predators, and recovering animals need a stress-free environment away from domestic animals, young children and loud noises. But if you don’t think hands-on wildlife rehabilitation is for you, there are other options. Wildlife rehabilitation groups often need people to answer hotline phones, make pouches and teats, sell merchandise and fundraise. You could also complete the Rescue Training Program and sign up to do rescues in your local area. Sadly not all animals that come into care can be returned to the wild. The reality is that many animals die. Often they are too sick or too young to make it through and some injuries simply can’t be treated. All wildlife should be examined by an experienced wildlife vet when they come into care to avoid any needless or prolonged suffering. 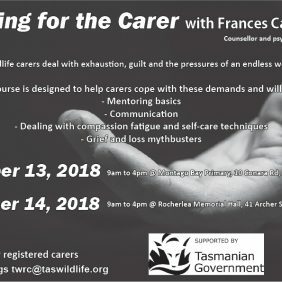 To rehabilitate protected wildlife in Tasmania you must complete the Wildlife Management Branch registration form and be granted a permit from DPIPWE. You will be required to prove you have sufficient resources and experience to be able to go it alone.